Every night after Evening Activity, we gather as a camp in a circle, lock arms, and sing the (full) Friendship Circle song followed by Taps and reflect on our day’s activities, our friends and our place at Quinebarge, today and always. Quinebarge is steeped in traditions. Indeed, our staff training pre-camp is called Traditions because we believe our staff need to understand our past to fully embrace what makes Quinebarge so special. At our first camp fire of each session, each new camper receives their Quine-Beads, and returning campers and staff wear their Quine-Beads. Quine-Beads, which represent each cabin a camper has been in unify cabins both today, and over the years, providing a bond. Every camper and staff member, including support staff, receive Quine-Beads. Quine-Beads, which we typically wear Sunday nights, serve as our black tie formal wear. Campers and staff bring their Quine-Beads to camp each year and add on to them. CITs receive a special Quine-Bead representing their CIT year. When Tom and Ruth Kenly and their work crew came to Quinebarge in 1936 to build the initial buildings, they made a plaque and placed it on our Dining Hall wall. 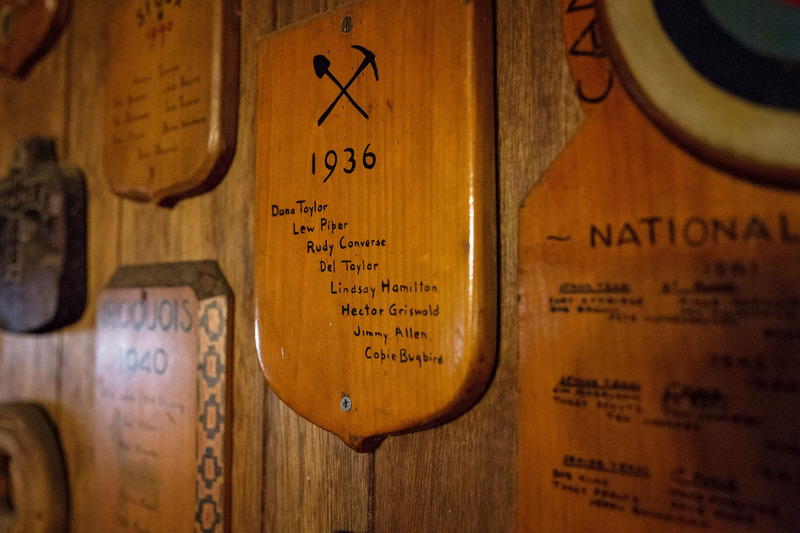 Since then, every camper and staff member to come through Quinebarge has had their names on their cabin plaque, which also hang in the Dining Hall. 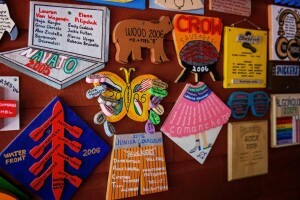 Plaques tie us together across the generations and make for great art work to view during meals. Each summer, former campers contact us and ask if their plaque is still on the wall and are amazed to see their plaques with the names of their great friends from their childhood. 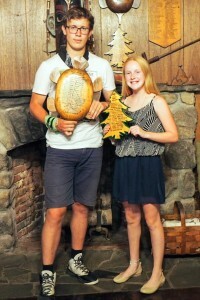 The Order of Kanasatka and The Pine Tree awards are presented to the boy and girl campers, respectively, who best represent the values of Camp Quinebarge, shows an appreciation for our heritage and has earned the respect of their fellow campers and staff. The awards are neither popularity nor best boy/girl awards, but, rather, about campers who fully understand what Quinebarge stands for. 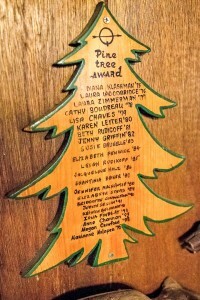 The Order of Kanasatka was first awarded in 1938 and each recipient is listed on the plaque in our dining hall, while the Pine Tree award was created when Quinebarge went co-ed in 1976. Frank Thomas “Tommy” Henshaw was from Milburn-Short Hills, New Jersey, the hometown of Tom and Ruth Kenly, our founders. Tommy was at Quinebarge from 1937-39, attended a prestigious prep school and later Princeton. However, World War II called him into the military shortly after Pearl Harbor, and he was killed in action in Okinawa in April 1945, earning a silver star for bravery. A basic stone with a small plaque honors Tommy on Piney Point and each July 4th our CITs tell the camp a little about his life. We honor Tommy Henshaw both for his service but also as a reminder that once a Quinebarger, always a Quinebarger, especially for someone who left very little permanent footprint. In 2012 we found his remaining family and in July 2014, his nephew, who was named after Tommy but never met him, attended our ceremony.